"ਸਾਡਾ ਫਿਕਰ ਨਾਂ ਕਰ, ਪਰ ਕਾਲੀਆ ਤੇਰਾ ਕਿਆ ਬਨੇਗਾ।"
On 9-5-16 we submitted a memorandum to the hon'ble Governor of Punjab Sh. Kaptan Singh Solanki seeking his involvement for getting the corridor opened. Since at times the Govt touts cause harm to our movement and it was observed during our last event (of 14-4-16 Hunger Strike on Border) when they were scaring away participants, it was thus decided that the touts will be kept away from the present event. Finally when they came to know of it on 9-5-16 they used their clout and our event was censored in the press. No media print or electronic carried our news. Although we had sent the press note to about 200 correspondents. Since we are used to such censorships but we feel sorry for the mediamen who have learnt to live with it i.e are tolerating this unqualified censorship in Punjab. When we used to study journalism we were taught the value of 'Freedom of Expression' which even the Indian constitution guarantees. We were taught how some committed journalists would fight censorship during the 'Emergency Days'. For Punjab the Censorship has lived rather too long from 1984 onwards and the most unfortunate part is that our Punjab journalists are used to it now. Tolerating censorship for such a long time means that are not digging but dug their own graves. If they are not free to write then how does it make them different from clerks? We are really fed up with this censorship and we have tolerated it for 15 years of our movement but now we have decided to shift a part of our agitation beyond Punjab. We are told that there are still some men among journalists beyond Punjab who are committed to freedom of expression. As for as fight against censorship is concerned we feel only the journalists will have to fight this battle. Now politician can start a fight. Because if people like us go to courts we will simply be told by the concerned media that that our news was not considered worthy of publication. We can only cry on social media etc. but no one will believe us. Unfortunately the politicians have also learnt to live with it. It was only Bhagwant Mann MP only who raised a cry on 'CENSORSHIP IN PUNJAB MEDIA' . Any way we are publishing here under the memorandum we submitted to the hon'ble Governor which my respected journalists considered worthy of censorship. Copy of Press Note in Punjabi is also appended below along with our photo at Haryana Raj Bhawan. Please note that we were specifically asked that not more than 5 people will be allowed to meet the Governor. God give you strength my journalists friend of Punjab. We understand that you are a compassionate person whose heart breathes for people. It is for this reason Bhagwan the God is pleased on your good self and has thus bestowed on you the rare position of Governor of 3 states simultaneously. (For a moment we will call this region plus Delhi as Greater Punjab). We are sure you will make this tenure a historic one. Sir, as you are kindly aware that a big chunk of the population of subjects of Greater Punjab are the migrants and their descendents who migrated from Pakistan in 1947 under a great duress leaving behind their hearths, homes, hawelies, hattis the shops and lands. They lost around 10 lakh (15 lakh according to some other sources) of their near and dear ones. A total of one crore of population migrated. Sir, the hardworking Punjabis have although in these 70 years re-established themselves but certain of the losses are irreparable. You will be surprised to know that the successive Govts of the Greater Punjab have avoided to teach this unhappy episode of 1947 to their pupils in school syllabi. We don't know whether it is deliberate or otherwise. But had it been there it would have given a great lesson on communal harmony. Any way the grand parents have passed on this tragic message to their children during their bed-time stories. So they can't forget their near and dear ones who were either lost or lost forever. Apart from material things, as you know, Indian people are always attached to their religious, cultural, historical places. We mean to say these migrants can't forget their gurdwaras, temples, tombs/samadhis of their elders. In this context the Sikhs in particular have to bear the greater pain because most shrines of their founder father namely Guru Nanak are in Pakistan. Over all there are about 500 such places of Sikhs and Hindus in Pakistan. It was for this reason the Nehru Govt in the nineteen fifties promised to the Sikhs that the Indian Govt will endeavour to see that the Sikhs continue to visit unhindered their holy shrines in Pakistan: (Ref. Nehru-Master Tara Singh Talks). Notwithstanding this the reality has been that the successive Congress Govts continued to be insensitive to this aspect. Of course the Govts do allow periodic jathas of pilgrims to such places as Hinglajgarh, Katasraj and Nankana sahib etc. Of late the Pakistan Govt has included Kartarpur in the Jatha itinerary. The irony is that for Kartarpur the pilgrim has to first go to Lahore which means a journey of more than 225 kms for a place which is only 4 Kms. from Indian border. 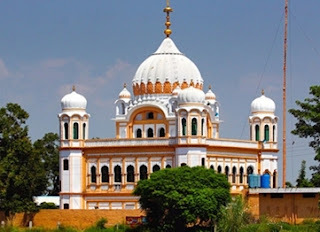 Kartarpur sahib a shrine right on the Indo-Pak border which is visible from Indian side has emerged as a symbol of the departed Sikh and Hindu shrines. The main importance of this shrine is that Guru Nanak passed away here in 1539 AD. This is the most sought after place on 3000 Kms long India-Pakistan border. One can see thousands of visitors at any time on Corridor Point on border from where it is visible. As discussed above the longing of people were of such a magnitude that about 25 lakh people visited the Corridor Point from March 1 to 15, 2014. Since Kartarpur is visible from the border (and there is no hindrance like the population in between) we started a peaceful movement from April 13, 2001, requesting the Pakistan Govt to grant a visa-less corridor to it. Respecting the Sikh sentiments the Pakistan Govt kindly agreed in principle for this corridor provided the Govt of India took up this issue with it; please see www.kartarpur.com. The Govt of Punjab felt the peoples pulse and Sardar Parkash Singh Badal CM himself moved a resolution in the Punjab Legislative Assembly on Oct. 1, 2010 requesting the Union Govt that it should demand corridor from Pakistan Govt. The resolution was unanimously passed. Obviously it meant the whole Punjab wants the corridor. But unfortunately at that time Congress Govt was in the Centre which always moved according to the feelings of a heart rather than mind as and when some issue relating to Pakistan was involved. God knows what comments the babuji gave on file the Congress Govt became silent on this without issuing a single statement. What more disrespect of the democracy could there be? After our hon'ble Narender Modi became PM two years ago we felt a sigh of relief because the the first decision Mr. Modi took was seeking a passage from China Govt to Kailash Mansarovar temple in Tibet Himalayas. To us it became evident that Modi Govt understands and respects the psyche of Indian masses who are deeply religious and are emotionally attached to their shrines, rishi-munis, Gurus and Pirs and faqirs. This bold step of the Modi Govt despite the fact that Kailash Mansarovar Temple has never been in the Indian Territory. One can only appreciate BJP's Govt compassionate stand on devotees aspirations. We are sure it has the same feeling for the devotees of the other faiths. • Granting hundreds of crores of subsidy to Muslim devotees performing Hajj. • Subsidy to yatris going for pilgrimage to Kailash Mansarover. • Allowing naga the naked sadhus in the public and in the Kumbh melas. • Spending hundreds of crores of rupees facilitating pilgrims visiting Kumbh melas. Visiting New Delhi Railway Station we see a mosque right in between the railway tracks. Its existence is a testimony that there have been sensitive governments right from the British days which respected peoples feelings and faiths. And sir, there are thousands of such examples where the civilized world respects peoples convictions. • At Sheikh Brahm mazar at Khemkaran district Tarn Taran which is only 200 metres from border inside the Indian territory. • At Chamleyal, R.S.Pura, the J&K. • At urs festivels at Ajmer and Hazrat Nizzamuddin, Delhi. • Samadhi of Shaheed Bhagat Singh, Rajguru and Sukhdev fell in the Pakistan territory but the Govt of India got the territory exchanged with Pakistan and took these samadhis inside India. We want similar approach for Kartarpur sahib which is only 4 Kms from border but clearly visible to naked eye, so much so that with telescope on border one can see if a man at Kartarpur sahib is wearing some spectacles or not. We therefore seek your intervention in this issue and request you to personally adopt this issue of millions of souls and remind the Union Govt to take a just and early decision on this Corridor demand, laying aside the views of the erstwhile Congress Govt. Not only the present but coming generations of Punjabis will ever remain indebted to you if you take up this issue. We hope you are aware that such migrants are in millions and many of them even can't afford getting the passport and visas thereby. For your kind information the civilised world is thinking on doing away the visa formalities. 27 countries of Europe have abandoned the visa requirement for journey in these countries for their respective citizens. It is the respect of peoples feeling that the Govt of Saudi Arabia has been allowing citizens of its enemy countries into its territory for Hajj purpose. We believe India and Pakistan will have to do the same may be today or tomorrow. Case of India and Pakistan is rather stronger because of the past forced migrations and the peoples refusal to forget their past places. 2. It will further be respect to the peaceful movements in the country. For your kind information that the movement for Corridor has all along been a peaceful one and the Sikh sangats simply do prayers at the border. 3. 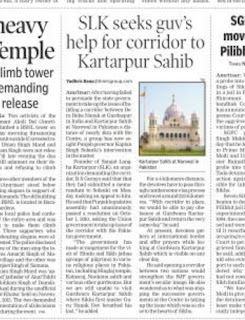 This will give great strength to the BJP Govt because a sizeable population of Greater Punjab wants such a corridor respecting the Sikh and Hindu shrines in Pakistan. Also we hope the BJP Govt understands how it needs to take some bold decisions. 4. Also no big security issue is involved in this as the Indian citizens will be visiting the foreign territory. It may have security concerns for Pakistan. Also we are to allow crossing of border after duly identifying our citizens. We hope unlike the Congress Govt the BJP Govt rather respects the democratic institutions. Thus if your good self takes up this issue you will 100% succeed as the souls of lakhs of people will be with you. May Guru Nanak bless you great health and energy to take up this pious cause. After having failed to persuade the state government to take up the issue of building a corridor between Dera Baba Nanak at Gurdaspur in India and Kartarpur Sahib at Narowal in Pakistan a distance of nearly 4km with the Centre, a group has now sought Punjab governor Kaptan Singh Solanki's intervention in the matter.Founder of Sangat Langha Kartarpur (SLK), an organization demanding the corridor, B S Goraya said that that they had submitted a memorandum to Solanki on Monday making an appeal to him.He said that Punjab legislative assembly had unanimously passed a resolution on October 1, 2010, asking the Union government to take up issue of the corridor with the Pakistan government. “The government has made arrangement for the visit of Hindu and Sikh jathas (groups of pilgrims) to various religious places in Pakistan, including Hinglaj temple, Katasraj, Nankana sahib and various other gurdwaras. But we are still unable to visit Gurdwara Kartarpur Sahib where Sikhs first master Guru Nanak Dev breathed his last,“ he added. For a 4 kilometre distance, the devotees have to pass through cumbersome visa process and travel around 225 kilometres. 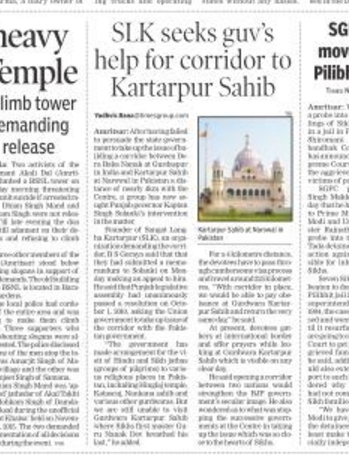 “With corridor in place, we would be able to pay obeisance at Gurdwara Kartarpur Sahib and return the very same day ,“ he said. At present, devotees gathers at international border and offer prayers while looking at Gurdwara Kartarpur Sahib which is visible on any clear day . He said opening a corridor between two nations would strengthen the BJP government's secular image. He also wondered as to what was stopping the successive governments at the Centre in taking up the issue which was so close to the hearts of Sikhs.